Ocado Technology is ready to put the SecondHands robot through its paces on the warehouse floor. 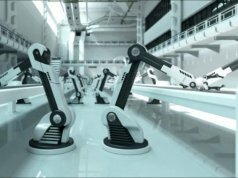 The Horizon 2020-funded project is aiming to develop collaborative robots (cobots) that can assist technicians with maintenance and repairs. In the not-too-distant future, technologists envisage a working world in which robots and humans collaborate on a daily basis. To begin with, that working relationship will probably revolve around practical tasks such as maintenance and repairs. 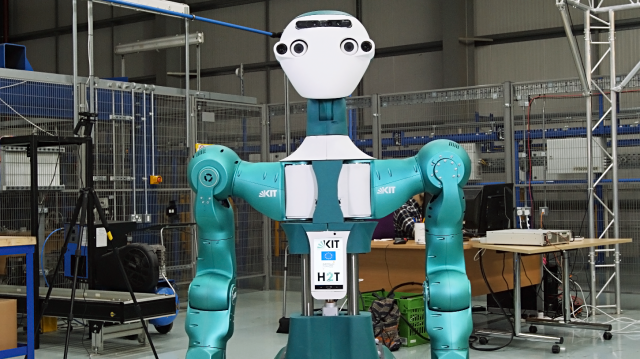 Today a prototype robot from SecondHands – funded by the EU’s Horizon 2020 project – has been presented to Ocado Technology. The prototype will act as a platform to test and develop applications related to the maintenance and repair of automated equipment in Ocado warehouses. The SecondHands prototype, ARMAR-6, was developed at Germany’s Karlsruhe Institute of Technology (KIT) by Tamim Asfour and his team at the High Performance Humanoid Technologies Lab (H²T). Ocado’s fulfilment centres are already highly automated, leading the way with regards to robotics in retail and logistics. The Ocado team has introduced IoT warehouse solutions, robotic arms and explored the potential of automated deliveries in recent times. Developing a team of robots to keep things running smoothly seems like the next logical step. Ocado Technology has been working alongside research teams from École Polytechnique Fédérale de Lausanne (EPFL), Karlsruhe Institute of Technology (KIT), Sapienza Università di Roma and University College London (UCL). From natural language dialogue to perception and planning, each team is contributing to a different aspect of the project. Ocado Technology’s role is to integrate all of that functionality and evaluate the robot in real-world scenarios. It’s on the warehouse floor that the online grocer will demonstrate how versatile and productive (or not) human-robot collaboration can truly be. Collaborative robotics represents a rapidly-growing part of the industrial robots market. The International Federation of Robotics (IFR) released the World Robotics Report in September 2017. It suggested that collaborative robot installations are expected to grow by 15% in 2018. SecondHands’ goal is an ambitious one. Arguably it’s attempting to find the solution to one of the biggest challenges facing robotics: working out how robots can safely, intelligently and productively interact with humans.